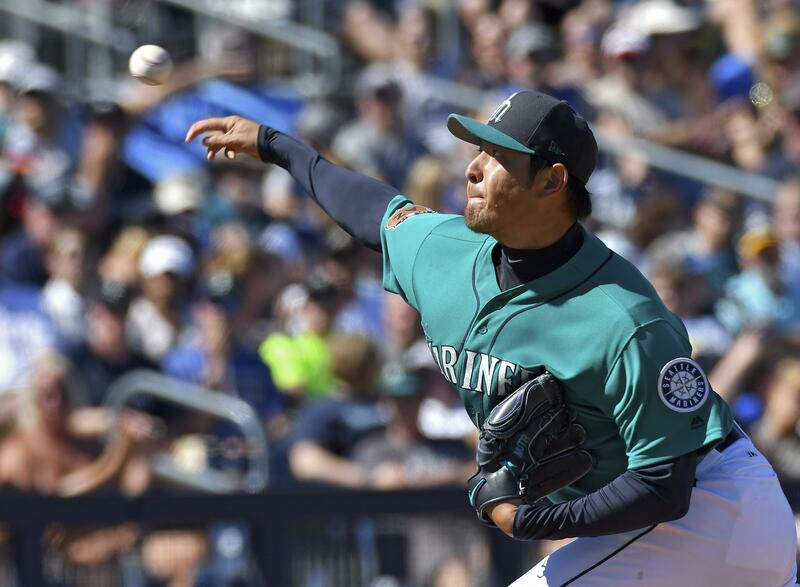 UPDATED: Fri., March 24, 2017, 8:05 p.m.
PEORIA, Ariz. – Veteran right-hander Hisashi Iwakuma shook off a sluggish spring on Friday by delivering 5 2/3 strong innings before the Seattle Mariners held on for a 4-3 victory over the Kansas City Royals at Peoria Stadium. Iwakuma limited the Royals to one run and four hits while striking out four and walking none in a 77-pitch effort. He previously allowed 11 runs and 16 hits over 10 1/3 innings in four starts. “Today, overall, I was able to focus on pitching my own game,” Iwakuma said. “The last couple of starts, I was testing things and working on certain pitches. The other split-squad game was far from good. The Mariners failed to get a hit in a 4-0 loss to the Los Angeles Angels in Tempe. Eight pitchers combined on the no-hitter. Just two Mariners reached base. Jean Segura reached on catcher’s interference in the fourth inning, and Zach Shank reached on a leadoff walk in the sixth. It was the first no-hitter in the Cactus League since 1996. Iwakuma’s strong outing came in his last extended spring start. He is tentatively scheduled to pitch just two or three innings in a tapered start on March 29 against the Los Angeles Dodgers. The Mariners (17-11) opened the scoring against Kansas City with a three-run third inning after Jay Baum, one of 21 one-day promotions from minor-league camp, led off with a double on a bloop to left. Baum moved to third on Guillermo Heredia’s fly to deep right and scored on Mitch Haniger’s RBI double over the head of center fielder Lorenzo Cain. Kyle Seager with his first spring homer. Iwakuma escaped a two-on, one-out jam in the fourth inning but surrendered a leadoff homer in the fifth to Paulo Orlando. The Mariners pushed their lead to 4-1 with a soft run in the seventh against Kansas City closer Kelvin Herrera. Mike Freeman led off with a single and went to second on Steve Baron’s fly to right. The inning should have ended on Baum’s two-out grounder to short, by Humberto Arteaga’s throw pulled Brayan Pena off first base. Freeman kept running and should been out at the plate, but Pena made an off-line throw. The proved to be the winning run when minor-league reliever Emilio Pagan gave up a two-run homer in the ninth inning to Jorge Soler. PLAY OF THE GAME: The Royals put their well-earned reputation for defensive excellence on display in the sixth inning. First, second baseman Raul Mondesi made a leaping catch on Seager’s leadoff liner. Then Gold Glove center fielder Lorenzo Cain made a diving and rolling catch on Carlos Ruiz’s sinking liner for the third out. PLUS: Reliever Dan Altavilla solidified what appears to be a certain roster spot by following Iwakuma with 1 1/3 scoreless innings. He has not allowed a run in 6 1/3 innings over five outings since giving up three runs to Texas on March 3…Haniger keyed the three-run third inning by delivering an RBI double with a runner on third and one out in the third inning for the game’s first run. It was his only hit in four at-bats, which dropped his average to .407 (24-for-59). MINUS: First baseman Danny Valencia went hitless in three at-bats, which dropped his average to .208 (11-for-53)…backup catcher Carlos Ruiz went 0 for 4. STAT PACK: The Mariners had just five hits but three came in their three-run third inning. UP NEXT: Left-hander Dillon Overton is slotted for five innings when the Mariners play Texas at 1:10 p.m. Saturday at Peoria Stadium. Lefty James Paxton should be sufficiently recovered from a head cold to start in a minor-league game against a collection of the Rangers’ minor-league players. Paxton won’t start the Cactus League game in order to avoid facing an American League West Division rival late in camp. It will be his second straight start in a minor-league game for that reason. Published: March 24, 2017, 5:32 p.m. Updated: March 24, 2017, 8:05 p.m.